Publisher: Dynamic Forces / Sandy Frank Entertainment, Inc.
Information: This squarebound book reprinted the entire ten issues of the original Battle of the Planets comic line from Western Publishing. Each issue is separated by one page of Battle of the Planets artwork and a reprint of the appropriate issue's cover. 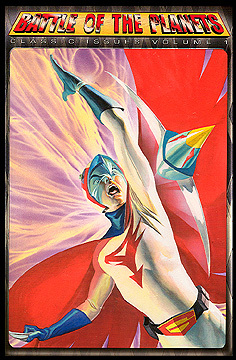 This version featured a special Alex Ross cover that could only be ordered through Previews magazine. The interior contents were the same as the standard edition. Black and white.